The spring is much more than a scenic area for canoeing and swimming; it plays a vital role in the survival of one of Florida's most beleaguered residents -- the manatee. Visitors can learn more about this endangered animal through ranger interpretive programs. A chair accessible observation platform provides a view of the endangered mammals that gather at the spring during the cooler months of the year. From November through March, the manatees leave the colder waters of the St. Johns River for the safety and comfort of the 72-degree spring. For hundreds of years the Timucuan Indians made the spring area their home. The spring run, river and the surrounding swamps and uplands provided food, clothing, shelter and materials for tools and weapons. Snails gathered from sandbars were staple food for these people. Over the centuries, the discarded shells formed a massive mound. By the mid-1800's, most of the Indians had been killed or driven south and pioneer settlers took their place. In 1872, the Thursby family built a large frame house atop the Indians' shellmound, safe from the floodwaters of the St. Johns. The pilings of the steamboat dock remain, relics of a bygone area. Camping, cabins, canoeing, fishing, boating, picnicking, swimming, scuba diving, and nature trails are available. CAMPING AT BLUE SPRING STATE PARK The park has 51 campsites. Each site has a picnic table, grill and water. Twenty-seven sites also have electric hook-ups. None of the sites have sewer hook-ups but there is a dump station located within the park. The sites vary in size. There are only a few sites that are of sufficient size to accommodate today's larger camping rigs. Reservations are taken for one hundred percent (100%) of our campsites. The reservations can be made up to eleven (11) months in advance from the day you wish to arrive. 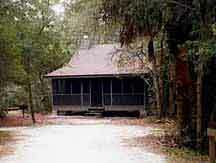 The campground is located in a pine forest within walking distance of the river and spring run. The campground offers accessible boathouse facilities. Primitive camping is available to registered backpackers. The sites are at the end of a four-mile hiking trail that winds through shaded hammocks and open flatwoods. Blue Spring has six(6) cabins. Each cabin has central air/heat, fireplace, two bedrooms, bathroom, fully equipped kitchen(stove and refrigerator), screened in porch, an outdoor grill and picnic table. Linens, pillows, blankets, towels and cooking and eating utensils are provided(linen is not furnished on a daily basis). One bedroom has a double-bed and a set of bunk beds, the other bedroom has a double-bed. One cabin is equipped for the handicapped. Six(6) people is the maximum per cabin. Four(4) people are included in the basic price; with an additional charge per person per night up to the maximum of six(6). Reservations may be made up to eleven months in advance with a minimum stay of two nights. A two night deposit must be received within 10 days after making the reservation. Reservations may be made in person or by telephone during the hours of 8 am to 12 noon and 1 pm to 3 pm Monday thru Friday. Blue Spring offers swimming and scuba-diving in a crystal clear, 72 degree spring run. Scuba-divers must register at the entrance station between the hours of 8 AM. and 3PM, with an up-to-date certification card and a partner. Swimming or diving with the manatees is NOT permitted. Blue Spring State Park is located in Orange City, two miles west on French Avenue.